I was born in the city, but while I was still in elementary school, just the thought of me in the local middle school had my mother moving our family to the country. My birth certificate may say city, but my heart is pure country. We got most of our vegetables from our own garden and often raised our own beef. I know for a fact that we were poor, but I didn’t know it then. I don’t ever remember being hungry. We were well fed and well loved. I should clarify though, that my mother’s version of well fed and mine are… different. For instance, Ma didn’t like broccoli; so, we didn’t grow it and we didn’t eat it. I seem to recall that we tried brussel sprouts one year – one time and not again. Did you know, that based on research, if a food is served/eaten 10 times in a row – not just once – a child is more likely to develop a taste for it? For dinner we ate a lot of home canned green beans, potatoes, tomatoes and corn, single or combo, beside a meat entree, with bread & butter as a filler. Ma was a good cook. The general thought was to make sure we had a decent start to our day, for school, and that we did not go to bed hungry. I honestly don’t think she gave much consideration to balance, variety, color or even what our bodies might actually need to grow. 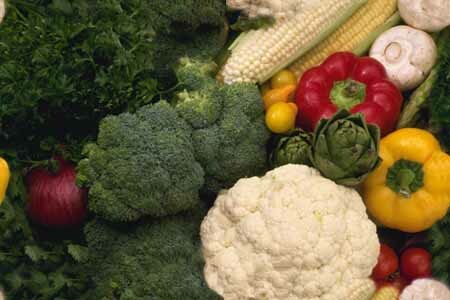 I have not found anything like Growing Healthy Homes – Nutrition 101: Choose Life! 448 pages, 6 units of study divided into 4 chapters each and thoroughly covering anatomy & physiology, nutritional health and home economics. This is a Biblically based curriculum that explains the systems of our God-created bodies and the foods that are needed to assist them in their jobs. The fact is: our body is affected by what we eat. The authors remind us of a verse from III John, chapter 2, “Beloved, I pray that you may prosper in all things and be in health, just as your soul prospers.” It is their desire “to honor God by creating and distributing products that educate and empower His children to establish healthy, Christ-centered homes.” Apart from creating and distributing products, their mission clearly mirrors mine for my family. The amount of information that has been compiled in this book is unbelievable! It can easily be used for the entire family, youngest child to adult; including high school credit. There are activities, science projects, art projects, vocabulary, fun facts and at least 75 recipes. Additional book suggestions, resources and discussion questions are listed at the end of each chapter and you’ll find 100 pages of charts, checklists and more. The authors, homeschool mother Debra Raybern, N.D., M.H., C.N.C., I.C.A. ; homeschool mother and researcher Sera Johnson, B.MU; mother and writer/editor Laura Hopkins, B.S. ; and mother, grandmother and former Home Economics teacher Karen Hopkins, B.S., are gracious, wise and encouraging. The over-size, hard-bound, vibrantly colored book is beautiful! (Yes, I love books, but, seriously, this one makes me feel rich just holding it in my hands. And it takes both hands to hold it because it is big!) It is $99.95. There is a CD-Rom available for $79.95, but my favorite option is also the best value, the combo of both for $129.95. I like having the book in my hands, and the flexibility to print the recipes and activities, with ease, from the download. And… I get to offer you, my reader, a 15 % discount when you use coupon code TOScrew11 at checkout. 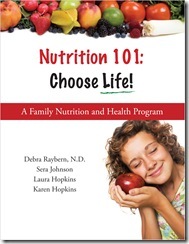 Growing Healthy Homes – Nutrition 101: Choosing Life! earns a 10 out of 10 Strawberries from our family. We received the download and we have not completed it, yet. Instead of printing and putting it into a large, cumbersome notebook, I am printing one unit at a time and putting each in a small, titled notebook. I like it! and I have no doubt we will use it for years. As always, you can find additional reviews, by my crew members, when you click on the TOS banner below. I love reading the stories from your childhood. Great job, thanks. Hmmmmm, makes me want to eat better….yummy! Mom would have laughed at your description….or cringed, I’m not sure which! LOL! Good read, thanks for the excellent review!